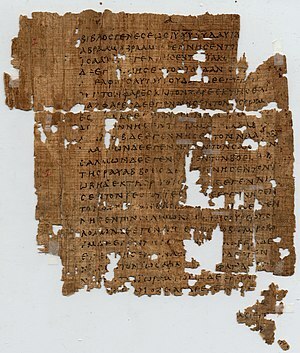 The front side (recto) of Papyrus 1, a New Testament manuscript of the Gospel of Matthew. Most likely originated in Egypt. For yours is the Kingdom, and the Power, and the Glory forever. I do wonder why that last line is so often left out. It’s definitely the perfect closing and every 2nd grader who has learned to write a letter has learned it must have a greeting, a body, and a closing. Ah, well, I digress…..
How often have you said these Words in worship or prayer or song and that’s just what they are..words? We’re going to take a couple of minutes and just look at a couple of hidden gems in this beautiful prayer. Jesus did not say ‘Every time you pray you MUST use these words. He said, “This, then, is how you should pray:” meaning this is a template, blueprint, or even an outline of how to do it. We are first, to recognize God for who He is and what He does. Next, we are to ask for what we need…food, forgiveness and freedom (from evil). Lastly, we are to once again give God all glory and honor for who He is. Notice, in verse 11, He tells us to ask for our DAILY bread. Look a little closer. If we reverse the two words they become…bread DAILY. I don’t think this is a mistake, nor would it be out of line to look at the words in this way. God wants us to ‘pray without ceasing’, asking Him, talking to Him, giving Him credit every hour of every day, day after day. Let’s take a look at verse 12. The word debts can be transliterated sins. Let’s think this through. Here’s another verse that when reversed adds more understanding. What if we say it like this. “As (in the same way) I forgive others, Father, forgive me.” Can you imagine the change in our hearts if we thought about that when we say forgive me. I don’t want to forgive the cruelty shown me by a church leader, but I expect You to forgive me anyway. I’m not going to forgive the abuses of my childhood, but I expect You to forgive me anything. I know in my heart that God has forgiven me completely but His expectation is that I will forgive all the hurts, wrongs, stabs in the back…just like He does. In the verses following this prayer I’ll paraphrase what He is saying: Those who forgive will be forgiven by Me. Those who don’t, won’t. Those are pretty powerful words for those of us who believe. Jesus was making a point that He wouldn’t have had to make if we were to remember what He said about forgiving…basically- JUST DO IT! It will be the most difficult thing I’ve ever done, but, I really don’t want to have to stand before a disappointed Father and explain why I chose not to forgive. Not gonna happen. Heavenly Father, Savior, Forgiver of my sins, teach me to forgive and not hold grudges. Help me to let go of things others have said and done and let You handle the situation. When I am asked to forgive just let me do it. Let my life be an example of forgiveness for those around me. Teach me Your ways, Lord. Make it so! This entry was posted in Fellowship with God, Forgiveness, Jesus, Prayer and tagged forgiveness, Matthew, Matthew 6:9, prayer by Marie. Bookmark the permalink.